Ja’afari refuses claims of chemicals’ usage. 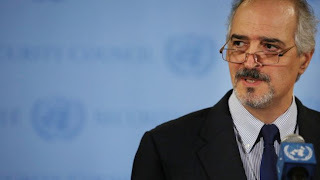 Syrian Ambassador to the UN Bashar Ja’afari stated to the Security Council that Syria’s enemies could provide armed men by chemical weapons to use them against Syria’s people and accuse the government as the doer. The Syrian envoy denied the claims that Damascus intends to use chemicals to solute the crisis.